Perhaps a few days ago you noticed that the Google homepage had been taken over by a giant Pacman themed logo? The fun and clever theme was in honor of Pacman’s 30th anniversary (May 22, 2010) but there is something about it a lot of people might have missed. If you waited on the page for 10-15 seconds, the logo would come to life in the form of a game. 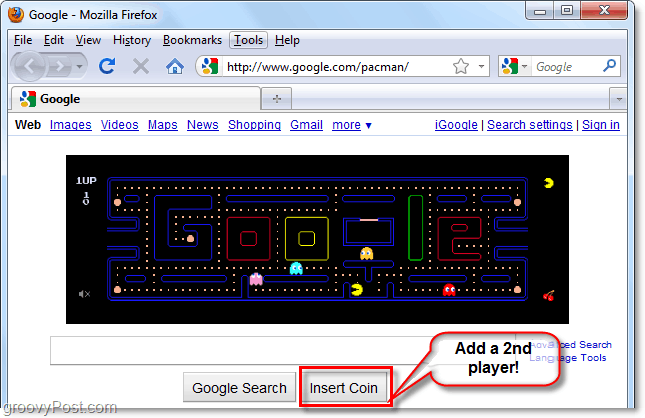 Yup, the Google logo Pacman game will run right there in your browser without any plug-ins needed. Groovy! It’s developed on the HTML5 platform, so you can even play it on your iPhone! The Google Logo version of Pacman is close to the original, but they’ve added a little extra. A year after the original Pacman was released a new version of the game came out titled Ms. Pacman (1981.) Throughout the game, she soon became known as Mrs. Pacman, and the rest is history. Google calls it an easter egg, but I’d say it’s just a cool two player function added to the logo game. To activate Mrs. Pacman in the Google Logo game all you have to do is Click Insert Coin, which is in the place of where the I’m Feeling Lucky button would normally be. You can control Pacman using arrow keys on your keyboard. If you add Mrs. Pacman to the game, she can be controlled using the WASD keys on your keyboard. I got to level 5 before I got bored. It was definitely a nostalgic moment though.